The Avg. Group Saves 20.2%! From planning our trip through checkout, Canopy by Hilton was superb. Customer service was off the charts fantastic; the accommodations were stellar and the restaurants and bars we're great! Canopy by Hilton exceeded our expectations! 12-Oct-2018 Verified Review, stayed from Tue Oct 09 to Fri Oct 12 2018 at a $279.00 group rate (5% discount). OPEN FALL 2017 - OCTOBER 2017 Hello and welcome to Canopy by Hilton Washington DC The Wharf, located in the Southwest Waterfront on the shore of the Potomac River. The Wharf is brimming with entertainment, dining and activities on and off the water. Get acquainted to the neighborhood with a local treat at check-in and then grab a Canopy bike to get out and explore. It's a quick walk to the National Mall, monuments and museums, and the L'Enfant and Waterfront stations are nearby for fast connections to greater DC. We have all the makings for a cool waterfront meeting! At Canopy, we've got you covered. Settle into a Just-Right Room with free WiFi, a 55-inch TV, refrigerator chests, Nespresso® machine, and bed designed exclusively for Canopy. Suites offer more space and privacy, plus comfy extras like robes and Canopy socks. There's a filtered spring water station on every floor so you can refuel and feel better going forward. Yes, you can arrive via Water-taxi too! Check out our images on instagram at CanopytheWharf. Forbes Magazine says The Wharf Neighborhood is one of the top 12 global destinations to meet in 2017! Enjoy a locally inspired welcome gift upon check-in and begin to experience DC like a local in our South West waterfront neighborhood! Access to a 10th floor rooftop outdoor pool faces our nation's historic city skyline. Or relax with a beverage on our 10th floor Penthouse terrace offering sweeping views of the Potomac river. Local Shuttle Info: Super Shuttle and Reston Limousine are our recommendations. Reston Limousine offers luxury transportation sedans to motor coach. Valet parking only $55 per car per night. The nearest Metrorail stops (METRO) and available parking for motor coaches in Washington, DC can be found at District Department of Transportation. For more information about Metrorail and connecting Metro bus routes. Addresses are followed by a NW, SW, NE or SE designation. The Canopy is located in the SW neighborhood across the street from L'Enfant Plaza at the corner of 7th St & Main St SW. The US Capitol Building serves as the point at which the District is divided into these four quadrants. Contact District Department of Transportation for permits. Because conditions change frequently, we will attempt to keep this information up to date. If you notice any discrepancy, please contact DDOT. 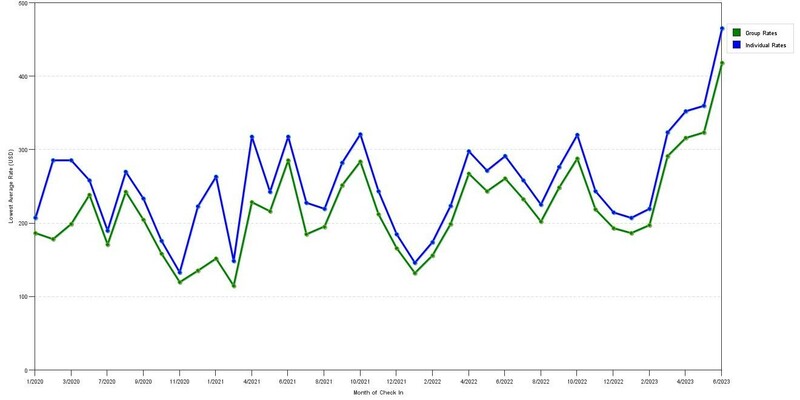 The graph above is fluctuations of room rates for both group rates and the lowest online individual prices our system could find at the time the group offer was placed. The lowest group/meeting rate displayed is 46.2% in the month of February 2019 and the highest average individual rate is $356 in the month of October 2018. This chart will show past seasonality and also project future months. If you are flexible with dates, you may want to consider staying at Canopy by Hilton Washington DC | The Wharf in a month when rates are lower. 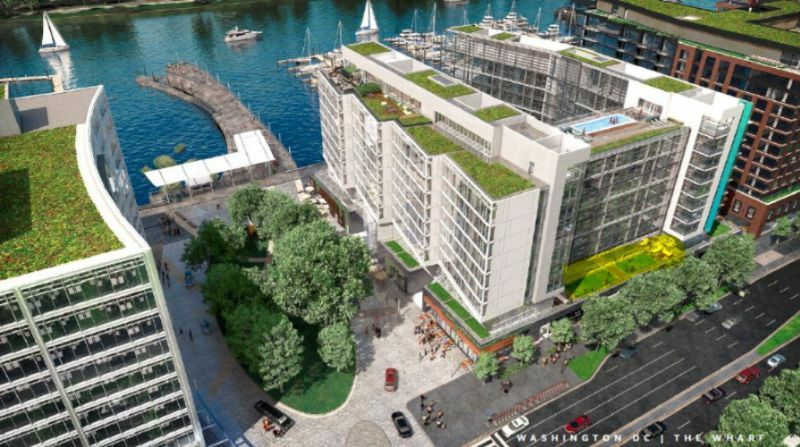 Below are the meeting, banquet, conference and event spaces at Canopy by Hilton Washington DC | The Wharf. Feel free to use the Canopy by Hilton Washington DC | The Wharf meeting space capacities chart below to help in your event planning. Hotel Planner specializes in Washington (District Of Columbia) event planning for sleeping rooms and meeting space for corporate events, weddings, parties, conventions, negotiated rates and trade shows. Our meetings and events space access is located in the Hotel building structure. Overnight guest rooms play host to social and corporate event guests while the penthouse rooftop patio, bistro and lounge beckons with sweeping views of the Potomac River. Informal gatherings can be had throughout the public spaces, where moments of rich history inspire the art gracing them. Our active waterfront location is conveniently located just 4 miles from Ronald Reagan National Airport. Our all glassed in meeting space offers natural light with our floor to ceiling glass walls. 29 x 17 x 14 Ft.
31 x 22 x 14 Ft.
28 x 17 x 14 Ft.
30 x 50 x 14 Ft. The 2nd floor Courtyard Terrace overlooks the waterfront and water feature! Availability is seasonal. 10 x 7 x 0 Ft.